After the first stage of Rally Portugal, set up as a spectator stage in Lisboa, flying Fords fin, Mikko Hirvonen has took the top spot on the 3.27km stage, to lead by 1.3 secs from 7 times champ Sebastien Loeb. With Petter Solberg 2.1 off the top spot. Some drivers commented on how slippy the tarmac stage was, going out on cold Gravel tyres an set-up. Ogier completed the stage in 2.9 seconds, followed by Fords Jari-Matti Latvala, with Federico Villagra heading ex-Formula One world champion Kimi Raikkonen. Armindo Araujo is the leading Portuguese driver in 10th overall after making the first appearance in his new MINI John Cooper Works Super 2000. The fastest PWRC drver was Norwegian Anders Grondal in his Subaru Impreza. 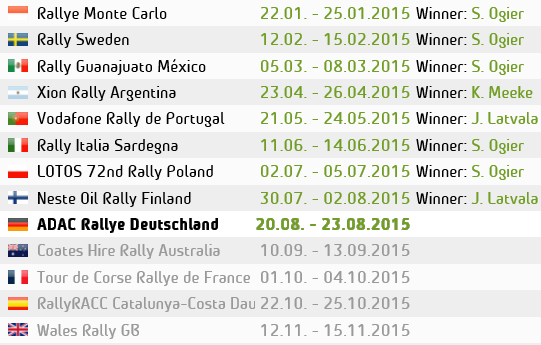 The short superspecial also marked the start of the FIA WRC Academy, which is lead by Yeray Lemes after stage 1. The action starts properly tomorrow out on the dusty gravel mountain roads.